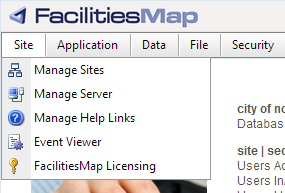 The Site menu option contains five items- Manage Sites, Manager Server, Manage Help Links, Event Viewer and FacilitiesMap Licensing. 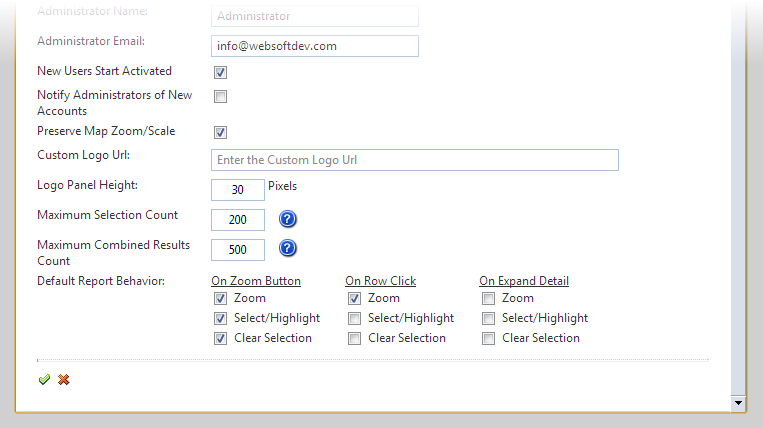 Click the pencil icon at the beginning of the row to edit the site entry. Site (required): Enter the name of the site. This value will appear as the web site title for the web site. If the FacilitiesMap installation has more than one site defined, then this value will be used in the drop down for the default login screen. Site Type (required): Select the type of Mapping Engine that will be used for the site. Currently ArcGIS Server 9.3 and MapGuide Enterprise 2010-2013 are supported. Enabled: Select this option to enable the site. Un-checking the option will make the site inaccessible and remove it as an option in the login site selection drop down list. Site Title (required): This is the name of the site, which is shown at the top of the browser window. Enable Print Legend: When using custom plotting, this will display the legend at the bottom. More information on customizing the Legend here. Allowed Print Scales: When using custom plotting, this will set the select-able scales in the drop down. Print Footer: When using custom plotting, this is the text on the bottom of the page. Mouse over the ? icon for custom output information. Encryption Key/Encryption IV (required): These values are used for passing security credentials to an outside application using FmStringParser.Encrypt/Decrypt functions. These need to match on the sending (FMv2) and receiving (outside application) end. These are a comma-delimited list of 24 integers from 0-255 (no spaces). You can generate random values on each by clicking on the randomize (die) icon in the parent site listing page. Background Login Image URL (optional): This allows you to set up an alternative background image for the map site login screen. This must be a fully qualified domain that links directly to a web-friendly image (.jpg, .png, .gif, etc). Domain Name (optional): This value only has an effect if more than 1 site exists. In this case, if the domain of either the administrator or login pages match the value here, then no dropdown will be shown to select sites, it will be assumed that the domain of the matching site is the one to be logged into. Site Login URL (optional): This field is used to specify the URL for the FacilitiesMap application. This value, if set, overrides the Site Login URL in the Server settings for this site only. Administrator Login URL (optional): This field is used to specify the URL for the FacilitiesMap Administrator. This value, if set, overrides the Administrator Login URL in the Server settings for this site only. Administrator Root URL (optional): This value must be set to the URL or virtual directory of administrator site where the default.aspx page is located. This is setup within the web server. For example: http://websiteurl.com/fmv2/admin. 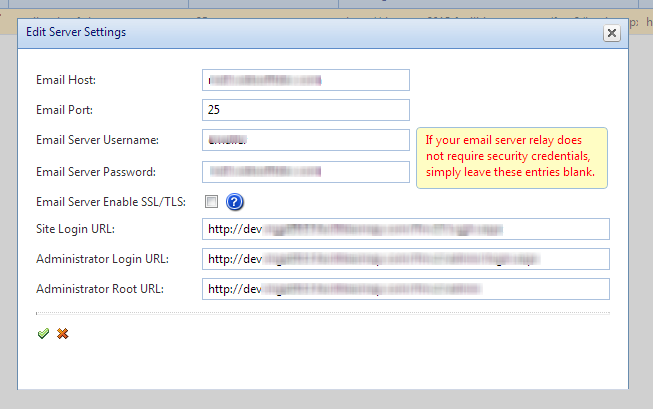 This value, if set, overrides the Administrator Root URL in the Server settings for this site only. Administrator Name: Enter the name of the administrator of the site. Administrator Email: Enter the e-mail for administrator of the site. This e-mail will be used when notifications are sent to users or when users are activated or try to retrieve their passwords. New Users Start Activated: If this field is selected, when a user registers to access the site, they will be automatically be activated and will be able to use the site immediately. Otherwise an administrator will have to activate the account. If unchecked, a new user will also receive an email verification email (with a link to click to verify their email). Notify Administrators of New Account: If this field is selected, when a user registers to access the site, the administrators will be notified via e-mail. If "New Users Start Activated" is not checked, the administrators will not receive an email until after the new user verifies their email address. Custom Logo URL (optional): This value can be used to replace the FacilitiesMap logo in the top bar panel of the Front End Interface. Logo Panel Height: This value controls the height of the logo panel on the front end interface. This value can be ignored, unless you’re using a Custom Logo URL. If so, then this value should be set to the height of the custom logo image. Maximum Selection Count: Limits the number of features that any individual user can select on the map and still get a result in the information panel. This limit exists to prevent users from overloading the server with extremely high selection requests. In general, this value should be less than or equal to the "Maximum Combined Results Count", which limits the amount of records that can be displayed (since most feature to record ratios are at least 1:1). Maximum Combined Results Count: Limits the number of records that can be returned via a search or by map feature selection and still get a result in the information panel. This limit exists to prevent users from overloading the server with extremely high search/selection requests. In general, this value should be greater than or equal to the "Maximum Selection Count", which limits the amount of features that can be selected (since most feature to record ratios are at least 1:1). Default Report Behavior: The options define how the application behaves when options are selected from results displayed in the Search Results (Infobar) pane. (Only supported with version 2 of the Search Results Pane) This section allows you to edit the site settings for your site. These settings will affect the overall functionality and display of the FacilitiesMap Application. Desired behavior when the magnifying glass icon is clicked in the object results pane. Desired behavior when a single row is clicked when multiple results (>=2) are returned in the object results pane. Desired behavior when a single row is expanded when multiple results (>=2) are returned in the object results pane. 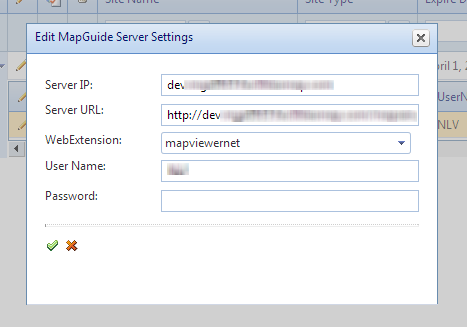 Specify the Site Type and then expand the record to set Map Server specific settings for MapGuide, ArcGIS server. Only one type of Map Server can be used at a time for a site. Map Server settings are required for both Map Definitions and the Feature Sources in the Data Definitions. If the server is not set correctly, the FacilitiesMap front end will not work. Note that some settings will require a user to logout and log back in before they take effect. Server IP: Enter the Server’s IP or domain name. Server URL: Enter the MapGuide server URL. This is the same URL used in MapGuide Studio to create and publish maps. Web Extension: Select the WebExtension that is used for this site. The options available for this version of FaciltiesMap are “mapviewernet” which provides support for the .NET API for MapGuide Enterprise 2010 and "mapviewerajax" which provides html based support. User Name: This is the MapGuide Server user created in the MapGuide Server Administrator. The username must match the exact USERID in the MapGuide Server Administrator. This field is case sensitive. Password: This is the password for the MapGuide Server user created in the MapGuide Server Administrator. This field is case sensitive. Server IP: Enter the IP Address or Domain of the ArcGIS Server. Server URL: Enter the URL of the ArcGIS server that will be used to deliver the ArcGIS maps. User Name: Enter the user that is defined in the ArcGIS Server Manager that has access to the resource defined in ArcGIS Server Manager. Password: Enter the password for the user that is defined in the ArcGIS Server Manager that has access to the resource defined. Email Host: This value is the address of the mail server that FacilitiesMap will use to send e-mail notifications to users. Email Port: This value is the port of the mail server that FacilitiesMap will use to send e-mail notifications to users. Email Server Username: This value is the username or account name of the e-mail account that will be used to send e-mail notifications. Email Server Password: This value is the password for the e-mail account that will be used to send e-mail notifications. Note: To change your password, enter a new password. To keep the current password, leave the password field blank. Email Server Enable SSL/TLS: Turn on SSL/TLS transport security for the connection to the email server. Site Login URL: This field is used to specify the URL for the FacilitiesMap application. Administrator Login URL: This field is used to specify the URL for the FacilitiesMap Administrator. Manage the help links that show up under the Help menu on both the Adminstrator and front-end of FacilitiesMap. Help Link Name: The text the user will see when they look at the help menu item. Help Link Url: The url link the help menu item points to. - Front End: Pick either Data Tab or New Window. Data tab opens the help link in a tab next to the map tab on the Front End. - Administrator: Pick either Bottom Frame or New Window. Bottom frame opens the Help link in the space below the menu in the Administrator page. This menu selection allows you to view a variety of events that take place in the application. You also may search the event logs for a specific event by filtering the records by entering a string into the appropriate filter box. Note: the values entered into the filter box for a given field are case sensitive. This page allows you to generate a licensing request. 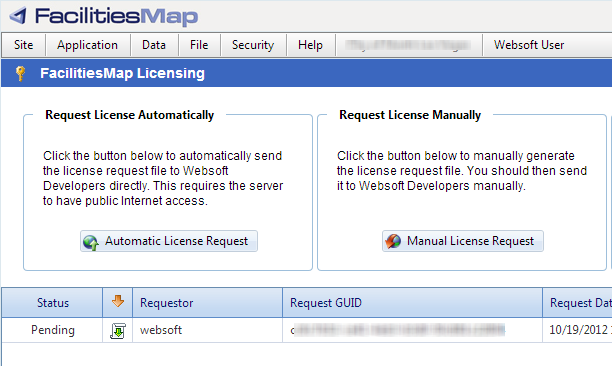 Automatic License Request communicate directly with our licensing server across the internet. 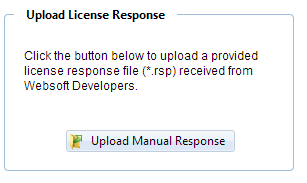 If internet access is blocked for your server, you can also generate a Manual License Request which will generate a file that you can email to us to request a license update. 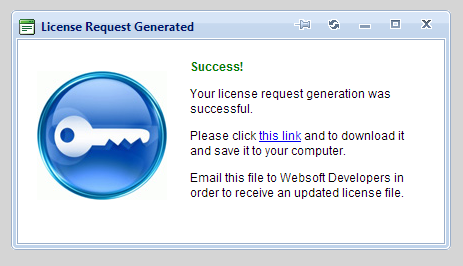 After emailing the license file to Websoft, we will email you back a license file. You will need up upload it to this page to be processed.